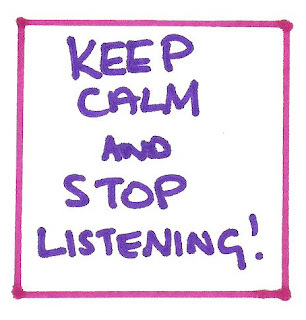 Listening is a good thing, I've even run courses to help people understand how to really listen to themselves and others, not just to words, but to tone, to meaning, to what the body is telling us, in order to ensure full understanding of what someone is saying, or not saying. However as with everything there are times when not listening is really useful. Those times when a part of us says, 'we can't', 'this might hurt', 'are you sure you really want this enough', I'm sure you have your own examples. What we need to do is understand what this particular voice / part of us is trying to achieve. For although the way it gets us to behave may seem to be against want we want, it has a purpose that is positive for us - just doesn't understand how to deliver it. By understanding what it believes to be true we can then get it to work with us and not feel as though part of us is working against what we want to achieve. This means we can then call on that part when we need it, rather than it appearing at an inopportune moment, we are then in control and make choices quickly and easily to do what we need to do in the moment. This is what mental strategies and mindset development is all about - understanding when we get in our own way, why it's happening and what we can do about it, before it interferes with our performance. And sometimes we will just stick our fingers in our ears and sing la, la, la until we've proved that particular doubting voice wrong! 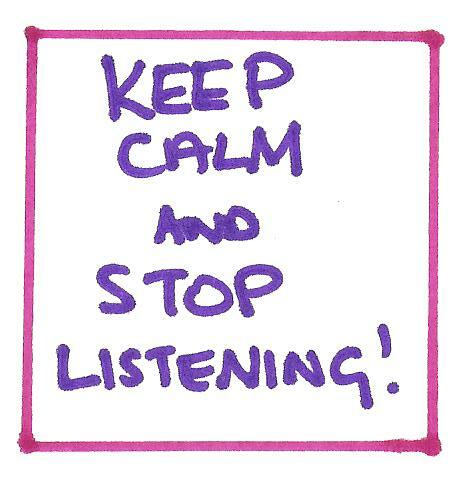 What are you concentrating on listening to and is it helping you or hindering you? What am I actually afraid of...?